Valentine’s Day is fast approaching. If you’re not sure how to make a successful romantic gesture to the one you love, you might want to consult with a zombie. Sure, they eat brains, but they’re capable of love, too – a love that can last forever. Host Frank Stasio talks with writer Jaym Gates about a new collection of zombie short stories she co-edited called "Rigor Amortis" (Absolute XPress/2010) that deals with love from beyond the grave. Walls joins host Frank Stasio to talk about her memories of a hard-knock childhood. Jeannette Walls' parents didn't seem to worry about her and her three siblings much. Not when Jeannette set herself on fire cooking a hot dog when she was a preschooler, not when the family had to repeatedly flee home after home with creditors at their heels, not when she rummaged through the school garbage to find her lunch. But in her best-selling memoir, "The Glass Castle" (Scribner/2005), Walls offers gratitude for the lessons she learned growing up and for her parents' gifts of love. The author joins host Frank Stasio to talk about her memories of a hard-knock childhood. Writer Langston Hughes is famous for uplifting poems like "I, Too" and lyrical poetry like “A Dream Deferred,” but North Carolina State Assistant Professor of English Jason Miller says that hidden within Hughes' works are powerful statements about the practice of lynching. Host Frank Stasio talks to Miller about his new book, "Langston Hughes and American Lynching Culture” (University Press of Florida/2011). As Duke University convenes its 25th annual conference on Alzheimer's disease, host Frank Stasio considers the state of the science and the literature with his guests. More than five million Americans have Alzheimer's disease. By mid-century, that number is expected to double, if not quadruple. Researchers are learning more about the progressive neurological disorder that affects memory and other functions of the brain, but there is still no treatment or cure. Writers have begun documenting the epidemic, creating fiction and nonfiction that renders the mysterious disease and how it uniquely changes the lives of patients and caregivers alike. The New York Times declared this writing a new genre, calling it "Alzheimer's Literature." Stephen Spaulding, a 7th generation member of the family, joins host Frank Stasio to talk about the upcoming reunion and what it meant to grow up Spaulding in North Carolina. About 700 members of the Spaulding family will descend on Raleigh, NC next week for the clan’s 18th bi-annual reunion. The Spauldings can trace their roots to Duplin County where Benjamin Spaulding, a freed slave, married Edith Delphi Jacobs, a Lumbee Indian, in the early 19th century. The Spauldings have ties to the founding and success of dozens of the state’s institutions like North Carolina Mutual Life insurance company, Mechanics & Farmers Bank and Lincoln Hospital. A conversation with WUNC reporters Dave DeWitt, Leoneda Inge, Jessica Jones and Laura Leslie about what they took away from their reporting on North Carolina’s energy future. 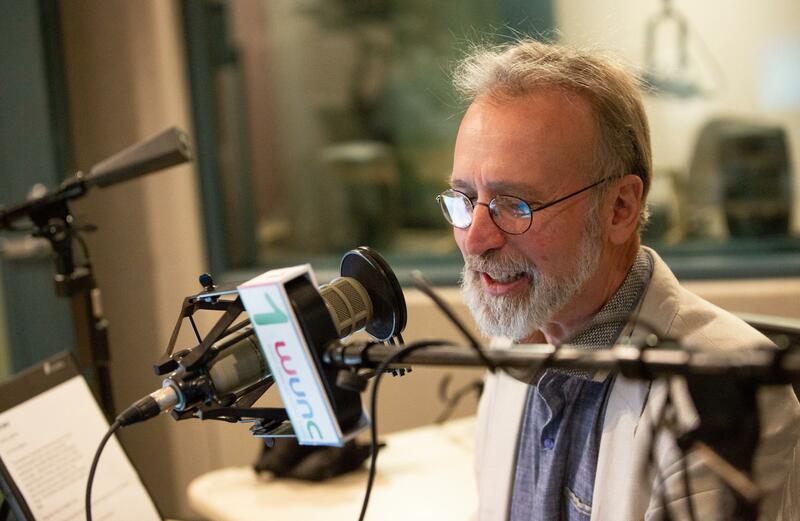 If you’ve been tuned in to Morning Edition this past week or so, you’ve been hearing a series of reports about energy from WUNC’s reporters. The series, “North Carolina Voices: Tomorrow’s Energy,” addresses where North Carolinians currently get their power and where we’ll get it in the future. A lot of work goes into those six or seven-minute radio reports, which means a lot also gets left out. The melody of a coal-fired power plant and the sculptural beauty of a wind turbine are among the details of the reporting that didn’t make it on the air. On today’s show, we’ll talk with WUNC reporters Dave DeWitt, Leoneda Inge, Jessica Jones and Laura Leslie about what they took away from their reporting and what else is left to say about powering North Carolina’s future. The White House unveiled a new and controversial plan to open up more than 160 million acres of ocean floor to drilling two weeks ago. Some states were omitted from the plan, but not North Carolina and its neighbors. We’ll find out why North Carolina politicians’ once vociferous opposition to offshore drilling seems to have fizzled. Plus, will the new drilling plan help land Obama a win on climate change legislation? The Student Nonviolent Coordinating Committee (SNCC) was founded at Shaw University in April of 1960. Hoping to harness the enthusiasm and willpower of young people to end segregation, founders Ella Baker, James Lawson and Julian Bond organized protests and actions across the south. SNCC was vital to the impact of the 1963 March on Washington for Jobs and Freedom. Singer-songwriter Don de Leaumont’s music is part storytelling, part folksy warmth and insight. In October, he released his fifth solo album, called “Planes, Trains, Crickets and Central Air.” Now a resident of Atlanta, Georgia, Don returns to his longtime home of Chapel Hill for a gig at The Cave. He joins host Frank Stasio in the studio to play some tunes and discuss how he broke his heavy metal addiction. The balalaika is a traditional Russian instrument with three strings and a triangular body. Oleg Kruglyakov, a native of Omsk City, Siberia, has been playing the balalaika since he was seven years old. Now, he's devoted to educating other cultures about Russian folk music and testing the limits of his instrument by teaming up with pianist Terry Boyarsky. The owners of Cassilhaus and a recent artist-in-residence there join host Frank Stasio for a conversation. A love of collecting photography led Frank Konhaus and Ellen Cassilly to include an art gallery in their dream home. Then the couple decided that they wanted to do more than just display art. They wanted to build an in-home studio space for artists to create in. Cassilhaus, the name of Frank and Ellen's dwelling, fulfilled their dream. Now, invited artists from all over the world come to their home to write, paint, sculpt, dance or just generate ideas for upcoming projects. Saxophone master and Durham resident Branford Marsalis has never shied away from a challenge when it comes to tackling music. The jazz legend's latest undertaking incorporates his sax into the classical music traditions of South America in a show called "Marsalis Brasilianos: Villa Lobos, Milhaud and the New Worlds of Brazilian Modernism." WUNC Reporter Dave DeWitt joins host Frank Stasio to discuss the case and what the settlement means for unions in North Carolina. Smithfield Foods and the United Food and Commercial Workers settled a federal racketeering lawsuit this week. Now the nearly five thousand workers at the plant in Tar Heel will have another chance to vote on union representation. Jan Boxill speaks host Frank Stasio about philosophy, the Olympics and her penchant for breaking barriers. Jan Boxill grew up playing football with her 11 siblings at a time when girls weren’t even allowed to march in the band because it was too strenuous. She went on to help found her college basketball team, and later became a college coach. For more than 20 years Jan served as the Public Address Announcer for Women’s Basketball at UNC and was even an announcer at the 1996 Olympic Games in Atlanta. John Rosenthal is renowned for his black and white photographs of New York City in the 1970s. The photos archived parts of the city that were vanishing and eventually disappeared: a dusty model of a ship in a bottle in the window of a social club in Little Italy, for example, or seltzer bottles stacked in wood crates.